What’s special about Premax Sports Sunscreen? Let’s start with the problem we were asked to fix. Many people spend hours training and competing outdoors, including cyclists, triathletes, runners, tennis players, and those involved in outdoor team sports such as football, cricket and field hockey just to name a few. The problem was, that many outdoor athletes would prefer to get sunburnt rather than wear sunscreen. The feedback we received was that greasy and oily sunscreens didn’t allow the skin to breathe during exercise, and athletes had issues with over-heating, sunscreen draining into their eyes, and/or being distracted by an uncomfortable layer of product on their skin. As a result, we were asked by many elite athletes and sports teams to “please make a sunscreen that we can wear when we’re exercising”. So, we did. 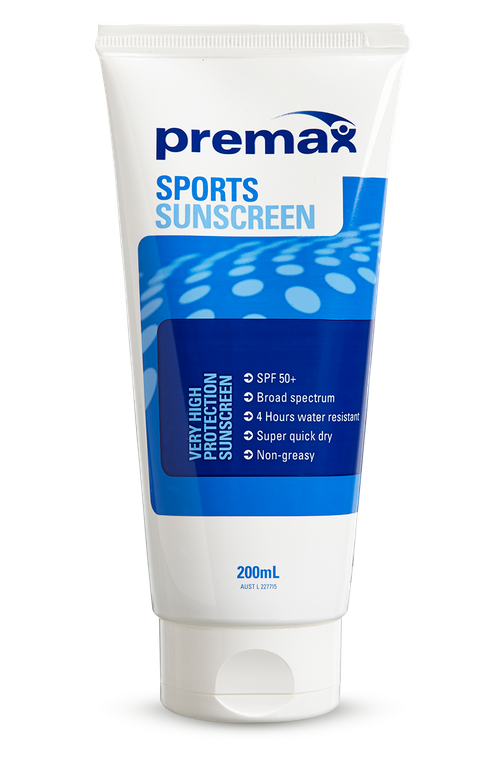 Premax Sports Sunscreen is a light and dry formula that you’ll hardly notice after it’s applied. It’s not greasy, or oily, and it will allow your skin to breathe whilst you exercise. Being such as dry sunscreen, it doesn’t sweat out or run as much as other sunscreens. It’s as sweat-resistant as it gets. 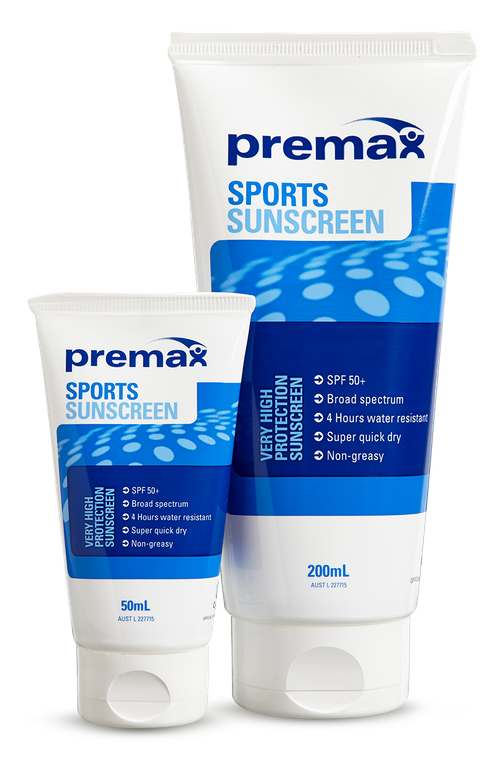 Premax Sports Sunscreen is SPF50+ which means it provides greater than 50x your natural sun protection. It filters both UVA and UVB rays. UVA can contribute to accelerated aging and UVB is the principle UV that causes sunburn, however both UVA and UVB contribute to increased skin cancer risk. We’ve got both covered. 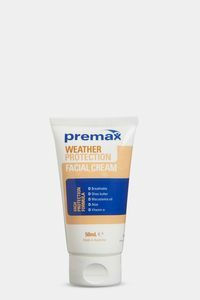 Premax Sports Sunscreen is also 4-hour water resistant. 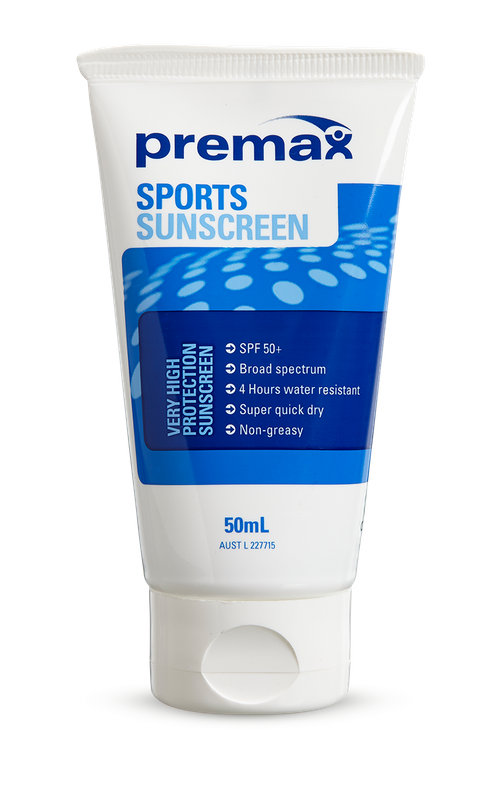 Lastly, Premax Sports Sunscreen contains soothing Aloe and antioxidant Vitamin E, helping your skin to maintain it’s condition whilst also protecting you from the sun’s damaging rays. How should you use Premax Sports Sunscreen? You should apply Premax Sports Sunscreen when you’re outside exercising, even if it doesn’t seem like the UV index would be that high, such as on cool and/or overcast days. Apply liberally and evenly at least 20 minutes before you get going outside. The current recommendation is to apply 35mL of sunscreen for one full body application. That’s a generous amount. Think of a teaspoon of sunscreen for your head and neck, each arm or leg, and for the front and the back of the body. Make sure you cover all areas that can be exposed to the sun, not just the face and neck. 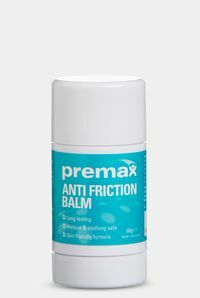 Although Premax Sports Sunscreen has been independently tested to be 4 hours water resistant, we suggest reapplying more frequently to ensure that you’re well protected. Where possible, reapply every 2 hours. Our 50mL tube is ideal to take on the go. It’s important that you look after your Premax Sports Sunscreen! Check the used by date, it does matter. If it’s out of date, please dispose of thoughtfully and replace with a new product. Also, don’t leave your sunscreen in the car boot or sports bag all summer long. Prolonged heat and light exposure will cause sunscreen to break down quickly and become less effective. Keep your Premax Sports Sunscreen stored in a cool, dry place. Test product for any skin irritation on a small area of the skin prior to use. Apply generously and evenly at least 20 minutes before exposure to the sun or swimming. Reapply frequently especially after swimming, towelling or exercising. Avoid contact with eyes, and sunscreen should not be used on broken, damaged or diseased skin. Always wear protective clothing, hats and eyewear when exposed to the sun. Do not expose young children to direct sunlight. Avoid prolonged exposure to the sun. If irritation develops, discontinue use. Avoid contact with fabric, as product may stain. If eye contact occurs, rinse thoroughly with clean running water. Being a long jumper, a lot of time is spent outdoors training and competing. 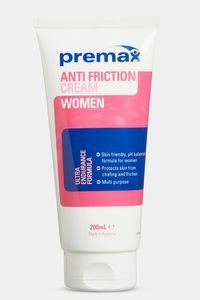 Whenever I am out in the sun it is important I apply Premax Sports Sunscreen to protect my skin. It is my go-to sunscreen product as it dries super quick, is a non-greasy formula and is a very high protection sunscreen. Premax Sport Sunscreen has been a life saver (literally!) to me ever since I was introduced to it. As a triathlete, I am exposed to the sun for hours on end and found this specific sunscreen to last through sessions without leaving that greasy feeling. After applying Premax Sport Sunscreen, I forget it's even there! Premax Sports Sunscreen is the best that I have ever used! Once applied, you don’t know that it is on which is awesome for me as I have sensitive skin and have to wear sunscreen every day.